The A1GP World Cup of Motorsport trophy is on its way to Ireland after Adam Carroll completed a dominant weekend at Brands Hatch with his second win of the day and fifth of the season. Carroll was competing with the Portuguese and Swiss for the title at the start of the weekend – but his two wins, two pole positions and one fastest lap ensured his rivals were left scrapping for second place with no hope of ultimate victory. “It was a perfect weekend for us,” he said. “We did what we wanted to do – the plan was to come here and win both races from pole. “You can never count guys like Switzerland out, but we proved we were too hard to beat. The momentum we had coming into here was fantastic – it couldn’t have worked out better. Ireland took the title with 112 points, while defending champions Switzerland fended off a strong Portuguese challenge to take second by 95 points to 92. The Netherlands were fourth with 75 points, and no other nation broke the 50 points barrier. After finishing third in each of the first three seasons Team GBR suffered a year of trials and tribulations, relieved only by Danny Watts’ pair of podiums in China, and limped across the line in 10th place with 28 points. Although Carroll’s sprint race victory had left the Irish on the verge of the championship, the Portadown driver still had to produce the goods in the feature race – and he did it in style, leading the entire race apart from his pitstops. He successfully held off Monaco at the start, and again at the restart following a safety car period caused by a lap one crash that eliminated India and China and wrecked Team USA’s race. The slick Irish pit crew ensured the first pitstop of the race passed with no trouble, but as the second round of stops approached Carroll came up behind the American car and found his lead being eaten away by the pursuing Dutch. Meanwhile Team GBR’s Dan Clarke, having gained places by dodging the lap one crash, was blasting past Australia’s John Martin and making a charge that would eventually take him to seventh place after qualifying 14th. Ireland’s second pitstop was slow as Carroll’s crew had to hold him while other cars passed, but proved just fast enough to stay ahead of the Dutch, and from there Carroll built a racewinning lead despite again encountering the last-placed Americans. Eventually some pitlane diplomacy between the two teams solved the problem. Outgoing champions Switzerland were gracious in defeat. Driver Neel Jani said: “It’s been an entertaining year, with a lot of close battles. 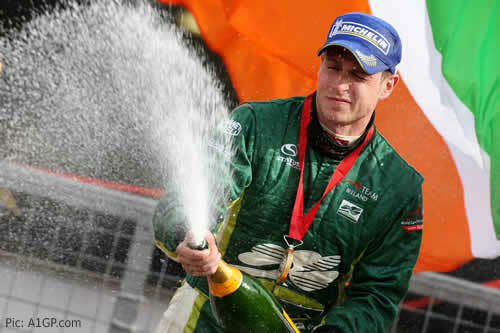 I knew it would be hard to beat Ireland at Brands Hatch. 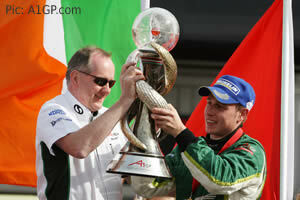 Categorised under A1GP, tagged under A1 Team Ireland, A1GP, Adam Carroll, Dan Clarke, Neel Jani, videos.